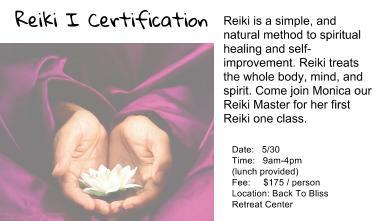 This May 30th we will be offering our very first in house Reiki Certification Training. 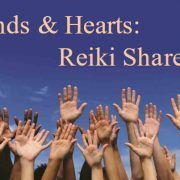 Join Reiki Master, Monica Groth in this one day seminar. Self-care and nurturing is essential for a balance and well-being. Reiki is a gentle, light-touch healing modality that can greatly enhance your ability to nurture and heal your loved ones. It helps heal physical and emotional blockages so that our life force energy, or Ki, can flow unimpeded. This leads to increased energy and vitality. Reiki helps one to enter into deep relaxation where healing at all levels can occur. It can also be used to relieve chronic pain and can safely supplement other healing modalities. During this training you will learn to practice self Reiki; learn about the philosophy of the seven Chakras; receive a Reiki Level 1 attunement and receive a Reiki Level 1 Practitioner certificate. Open to all – licensed therapists and public. Class is limited to 8 students. Location: Back To Bliss – Retreat Center located five minutes north of Marshfield. For more details feel free to comment on this post or call Back To Bliss and speak to Monica in person.